The Motorola Droid Turbo is a powerful smartphone with the latest high-end components, a better-than-average rear-facing camera, and a guaranteed two days of battery life—but it’s only available to Verizon Wireless subscribers. That’s the Motorola Droid Turbo’s biggest setback, and one that will likely keep it from becoming a best seller. I’m impressed with how much thought Motorola put into this handset, but the fact that it’s tethered to Verizon’s network means that only a limited few will have the option to experience it. And its basic, manly design makes it hard to justify switching carriers for. Remember when Android phones were plain bricks with a bit of red or silver trim around the edges? It seems Motorola’s feeling nostalgic, because that’s what the Droid Turbo reminds me of. I’m under the impression that the Turbo’s target demographic is middle-aged men, hence its utilitarian design. I’ve seen what Motorola can do with phone design and I’m disappointed it didn’t carry that over to this particular device. Look at that basic red kevlar-covered back. The Droid Turbo sports ridged metal buttons for both its volume rocker and power button, and they feel more sturdy than the buttons on other phones. You’ll also find a ridged Motorola “M” logo on its backside, as well as a ridged bar across the front-facing speaker. I think it looks cool, but it certainly reinforces that masculine aesthetic it’s got going on. The Turbo’s ridged buttons are kind of neat. The Turbo features a fantastic 5.2-inch Quad HD Super AMOLED display with a pixel density of about 564 pixels-per-inch. The display is fully visible from any angle, and its color profiles aren’t overly saturated like Samsung’s Super AMOLED displays. My only complaint is that it would have been nice if Motorola extended the display down a bit and used soft, on-screen buttons instead of off-screen capacitive buttons. When it comes to specs, the Droid Turbo is one hell of a smartphone. It’s packed with a quad-core 2.7GHz Qualcomm Snapdragon 805 processor, 3GB of RAM, and a whopping 3,900mAh battery pack, which we’ll touch upon in the next section. Like your momma told you once: it’s what on the inside that counts. Performance is what you’d expect from the latest processor on the market—everything is incredibly fast and responsive. You don’t normally see a device slow down until later on in its life, however, after you’ve downloaded and installed hoards of apps and services. I didn’t experience too much of a slow down after six months with last year’s Moto X, or two months with this year’s refresh, so I imagine the near-stock Android on offer here will manage the same. The Turbo is getting Android 5.0 Lollipop soon. I did experience some slow downs with Verizon, however, which typically has the most consistent 4G LTE connection in the Bay Area. I switched between streaming local radio through TuneIn and Digitally Imported and both apps struggled to buffer any content throughout my train ride through the Oakland Hills, where reception is typically spotty. What made it worse, however, was that I had to force close apps and then turn data on and off to try to get a measly 3G connection. On the plus side, I barely lost any battery life in the process. 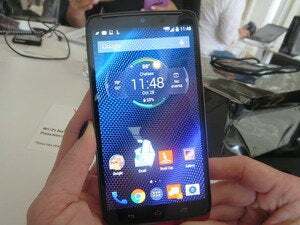 One of the Droid Turbo’s biggest hardware setbacks—besides its basic style—is its single-speaker setup, which is a shame because Motorola graced the Nexus 6 and Moto G with stereo sound. It can get loud, but not as loud as its predecessors. Thankfully, it doesn’t sound tinny. The Droid Turbo is the Jason Voorhees of phones: no matter what you do, you just can’t kill it. I mean, you can, but it will take a really, really long time. And it’ll come back in the sequel seeking vengeance. The phone that never dies. The Turbo lasted from Monday morning to Wednesday morning—about 48 hours of use, just as Motorola advertised. This wasn’t on standby or airplane mode either: I streamed live radio through the aforementioned apps, checked Twitter and Facebook, downloaded podcasts over the LTE connection, and even placed a phone call to order dinner. Every time I checked the battery meter it had barely depleted a few percent. We have one more battery test to do before we can officially confirm how truly long-lasting the Droid Turbo’s battery life is. However, the general consensus from other reviewers seems to be that the Turbo is indeed longer lasting than most of the newest flagships out there. Finally: Moto packs its smartphone with a rear-facing camera that doesn’t make me cry. One of the reasons I’ve refrained from switching to a Moto X as my daily driver is that its photo-taking abilities are subpar. However, the Droid Turbo’s rear-facing 21-megapixel camera made me rethink my stance: the photos it took were remarkably clear and it certainly gave its counterparts a run for their money. Lab shots with the Droid Turbo include a low-light shot (left), flash shot (middle), and regular shot (right). Its low-light performance could have been better, but compared to how the Moto X fared I’d say this is a huge improvement—just try to ignore the graininess. I snapped this photo out my window while driving home. Pretty good for rolling through at 20 mph. Thankfully, Motorola stuck to its own camera app for the Droid Turbo, rather than Google’s stock Android camera. It’s easy to use, too: tap on the screen to take the photo, and then slide from the right to get to the Gallery. If you need to adjust something, slide over from the left to bring out the Settings. The Droid Turbo’s camera interface. Video capture tops out at 24 frames-per-second in 4K recording mode and 30 frames-per-second in 1080p recording mode. I recorded video while driving down my suburban streets, and was impressed with the phone’s ability to maintain exposure, though with no image stabilization, the scene can get pretty jarring if you don’t hold the phone still. All hail the glory of the almost-stock Home screen. 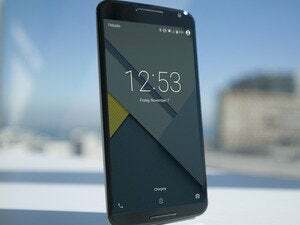 The Droid Turbo runs near-stock Android 4.4.4 KitKat, though it will soon get an update to Android 5.0 Lollipop. The interface is plain vanilla for the most part, and will require some tender love and care when you first bring it home. It also doesn’t utilize the nifty Google Launcher on phones like the Nexus 5, where Google Now lives on its own Home screen. Motorola’s add-ons are almost indispensable. However, you do have all of the Moto X’s neat add-ons packed into the Droid Turbo, like Motorola Connect, Assist, Display, and always-on listening. Just like its flagship counterpart, these features work really well and you don’t have to worry about them eating up battery life. There are also sensors that can detect when you’re about to grab the phone so that it lights up with the appropriate information. 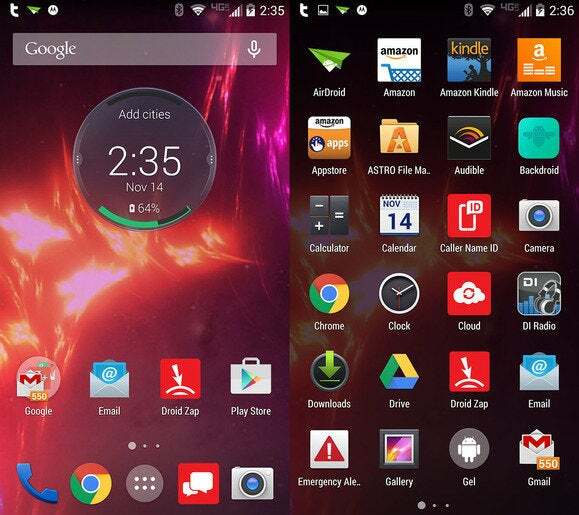 Because the Droid Turbo is a Verizon exclusive, you’ll have to contend with Verizon’s bloatware. This includes the carrier’s own messaging and navigation apps, as well as Verizon “Protect,” which scans for malware and blocks “risky” websites. I don’t doubt that there are dangerous websites out there, but the bundled security app right out of the box reminds me of when I’d bring home a laptop and have to deal with whatever virus scanner would eat up all my memory. You can disable any of these Verizon apps in the application manager, but you can’t entirely remove them. Also, be careful not to make Verizon’s Navigator your default Maps application, either, because it will either charge you 99 cents for every day that you use it. The Droid Turbo is a darn good phone that’s only available on Verizon. For now, if you’re locked in to Big Red and are looking for an all-around great phone that can do just a little bit more than your friend’s—and you don’t mind its uninspiring, utilitarian design—the Droid Turbo is worth your consideration. if you’re locked in to Big Red and are looking for an all-around great phone that can do just a little bit more than your friend’s—and you don’t mind its uninspiring, utilitarian design—the Droid Turbo is worth your consideration.